These are the days when you can actually spell out a list of reasons for losing deep quality sleep night after night. Stress, a variety of tensions, aches and pains can be named as a few. However, there are times when you can pile it all up and blame your food for gifting you with thoroughly low quality sleep for weeks at a stretch. Whether you like it or not, you will be amply benefited by the piece of information that the levels of nutrients in the food you eat play a role in improving the quality of your sleep or spoiling it. If you are missing out in these nutrients, there is every reason for you to face a disturbed 8 hours in bed. Potassium and Magnesium – Potassium and magnesium are two vital nutrients that have been named as far as relaxing muscles are concerned. This goes a long way in improving the quality of your sleep. At the same time, these nutrients ensure regulation of blood pressure which adds to the cause. Bananas are one of the best known sources of potassium and magnesium. Packing on a couple of these plantain products will help you achieve an uninterrupted sleep. Tryptophan and Carbohydrate – This is not one of those regular nutrients you hear about every day, but does play an essential role in helping you sleep better. This is a form of amino acid that is found in protein foods and works to promote sleepiness in the body. The carbohydrates ensure making tryptophan available to the brain to create the sleepy effect. Basically, a combination of lean protein and carbs as bed time snack can create this effect. 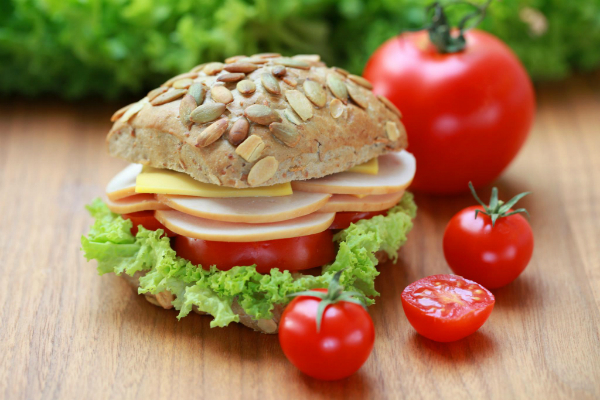 A lean turkey open sandwich can be mentioned as an example. Melatonin – Melatonin is a hormone that is made by the pineal gland located in the brain. It is vested with the responsibility of managing the sleep and wake cycle of a human being. Irregular production of melatonin or interruption in the same can compromise the quality of sleep dramatically. So, it is imperative to maintain the level of melatonin at all times by eating foods that is rich in this nutrient or taking supplements of the same. Vitamin B 6 is usually responsible for producing melatonin in the body. Foods like fish, chick peas can be mentioned as examples. Vitamin C – Yes. Besides boosting your body’s immunity, Vitamin C plays its part in improving the quality of your sleep as well. Firstly, Vitamin C plays a very important role in combating stress which goes on to improve the quality of sleep at night. It is also an anti depressant and thus, keeps the entire physical and hormonal system stress free to function the way it is intended. Eating foods rich in vitamin C like citrus fruits and vegetables every single day can be extremely helpful for a sound and undisrupted sleep. ← 10 Reasons Why You Should Eat Raw Garlic Everyday!